Money: Give Now, in a Recession? Economy in Shambles,” “Unemployment Rate Skyrockets,” “Chrysler and GM Bankrupt,” “Retirement Savings Evaporate,” “Housing Prices Plummet.” Nearly 60 banks have failed this year, following the closure of 25 banks in 2008. The Department of Labor reports that unemployment in the U.S. is 9.5 percent, and it is expected to get worse before it gets better. Fear is causing many people to postpone retirement and vacations, cancel purchases, sell assets or take other defensive measures. Some people have reduced donations to their church or other charitable institutions even as needs are rising. Some faithfully continue to give even though the future seems uncertain, and others start to give for the first time. Yet others faithfully continue to give even though the future seems uncertain, some even increasing the amount they give, and others starting to give for the first time. Why do some respond to uncertain economic times with generosity? 1. The future isn’t really uncertain. Although in times of disaster and economic upheaval, uncertainty is abundant, believers know that our salvation and our ultimate future are secure in Christ. Jesus created us and he sustains us (Colossians 1:16-17). He tells us not to worry because, like the birds and the flowers, he will provide for our needs (Matthew 6:25-34). 2. Our assignment hasn’t changed. and teaching them to obey everything I have commanded you. And surely I am with you always, to the very end of the age” (Matthew 28:19-20). 3. Physical and spiritual needs increase during tough times. In periods of trial and crisis, people are more receptive to the good news of the gospel. Those who continue giving generously know that it is important at such times for the church to reach out even more, rather than less. 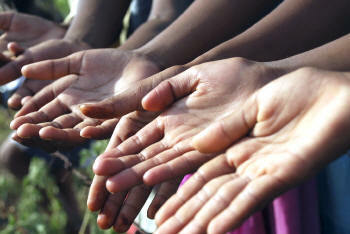 Believers function as Jesus’ hands and feet in the world when they provide for those in need. 4. We have hope to share. through us. We can point the weary to Christ, to the one who offers willingly to carry our burdens (Matthew 11:28). We know that his amazing grace conquers our sins, makes us alive in him and gives us hope, and we want to share with others that peace of heart and reassurance. how best to respond to the current economic fallout. Whatever we decide, we can take joy in knowing that Jesus loves us and will never let us go, and that we have part in sharing his good news around the world. Mathew Morgan is denominational Treasurer and Secretary of the Board of Directors for Grace Communion International.